A hotel boom, a retail renaissance, a blockbuster program of arts and theatre, great Aussie road-trips and World Cup Cricket at the ‘G’ – Melbourne continues its quiet evolution as one of the world’s must-do destinations in 2014. Here are 20 of the hottest reasons to tick Melbourne of the bucket list in the new year, and some of 2013’s most popular (copyright free), instagram images. When the people of Melbourne are gone at night the streets and buildings come alive. Melbourne Now , is the largest and most ambitious project ever to be undertaken by The National Gallery of Victoria (NGV) – showcasing to the world the full depth of Melbourne’s creative credentials from November 22 to March 23, 2014. Melbourne is eagerly awaiting the second White Night event. From dusk until dawn on Saturday 22 February 2014 the arts community will come together with an accessible and exciting all night long art and culture experience showcasing Melbourne as Australia’s international city of artistic innovation. Dreamworks Animation: The Exhibition will open at the Australian Centre for the Moving Image at Federation Square next April. It will showcase the work of the animation studio founded by Hollywood heavyweights Steven Spielberg, Jeffrey Katzenberg and David Geffen 20 years ago. Highlights will include Shrek, Madagascar, How To Train Your Dragon and Kung Fu Panda. Raphael, Correggio, Titian, Tintoretto, the Carracci and Tiepolo are among the names of Italian masters that will grace the walls of the National Gallery of Victoria from 16 May 2014 until 31 August 2014 as part of the Italian Masterpieces: from Spain’s Royal Court Museo del Prado Melbourne exclusive. The exhibition will showcase more than 100 works spanning 300 years of Italian art. Australia’s biggest ever exhibition to focus on Indigenous Australia opened in 2013. At the Bunjilaka Aboriginal Cultural Centre at Melbourne Museum First Peoples tells the story of Aboriginal Victoria – celebrating the diversity, continuity, strength and vitality of Koorie people over 60,000 years. Luxury retail brands continue to migrate to Melbourne in 2013. Chanel and Dolce & Gabbana both opened flagship stores and shoppers are eagerly awaiting the new Emporium Melbourne. In the high street range, H&M has chosen Melbourne for its first Australian store taking over Melbourne’s iconic GPO building in Bourke Street. Makers Melbourne is woven into the fabric of the city and now it’s easy to take a little of that home with the many design and craft markets popping up. Once or twice a year is Melbourne Design Market at Federation Square and Big Design Market at the Royal Exhibition Buildings. In summer the People’s Market in Collingwood, Suzuki Night Market at Queen Victoria Market and Style After Dark at South Melbourne Market and every weekend, the Rose Street Artists Market in Fitzroy are just a few of the names to look out for. Destination shoppers to Melbourne can also flex their wallet for good; Melbourne is one of the world’s leading cities for social enterprise movements. Buy a beer at Shebeen Bar and your money will go directly to development projects in that country, grab a coffee at Streat Melbourne and you will be helping young people get off the streets. The Australia Day Fireworks have found a new home at Melbourne’s Docklands precinct for 2014, and that’s not the only newcomer to the area. The Sebel Melbourne Docklands opened in October and two other hotels announced construction timelines, M Docklands by Peppers and Altus by Pan Pacific, a spate of new eateries include Vietnamese Banoi. The Melbourne Star Observation Wheel also in the Docklands has announced a December 2013 opening. At 120 metres high, guests will enjoy uninterrupted 360-degree views of the city, Port Phillip Bay and as far as Mount Macedon, Arthur’s Seat and the Dandenong Ranges. Marysville, just an hour out of Melbourne, has been completely rebuilt after being devastated in the Black Saturday bushfires of 2009. 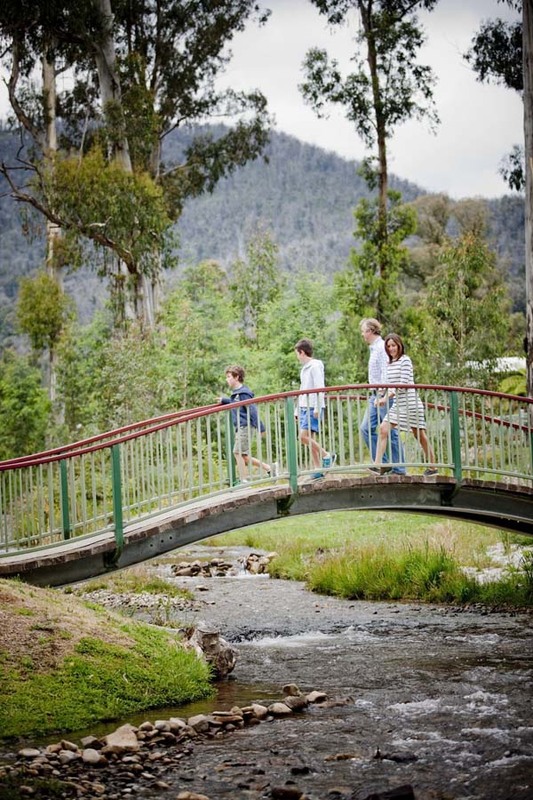 The town lies at the edge of the Yarra Ranges National Park and within easy distance to Yarra Valley wine region. Walk, hike or take a drive to appreciate the majestic mountain ash trees, rainforest and waterfalls. Visit for the day or stay the night in one of the quaint B&Bs or self-catering cottages and enjoy the quality food and hospitality from the region. As regular visitors to Victoria look to expand their horizons and newcomers are more independent than ever before, self-drive touring routes including Great Southern Touring Route, South East Touring Triangle and Sydney to Melbourne Touring are proving a popular way to see the many diverse regions around Victoria. Melbourne is on a hotel high. New hotels opened in the city recently include Tune Hotel Melbourne, The Sebel Melbourne Docklands and Oaks on William. Renovations include the iconic Adelphi Hotel as well as Pullman Albert Park. The new five-star Sheraton Melbourne Hotel is due for completion in March 2014 and a new Art Series Hotel is slated for December 2014. From an office staircase to a former switchboard, there is no such thing as dead space in Melbourne. Creative entrepreneurs have transformed under-utilised spaces into some of the city’s hottest eating and drinking venues adding yet more layers to Melbourne’s café culture. Flipboard Café, Switchboard Café and Something Tiny is squeezed under the staircase of warehouse offices are some examples. Sea Life or shoe shining? An AUD$8 million five month renovation has given Melbourne Aquarium a new lease of life. Sea Life Melbourne The all-new attraction features a multi-million dollar, state-of-art Croc Lair exhibit, which houses a spectacular five-metre, 750kg Saltwater crocodile, named Pinjarra. It also joins a global network of conservation-focused aquariums under the SEA-LIFE banner. Classes, workshops, discussions and lectures are emerging in a locations such as cafés , clothing stores, pubs and museums. From fine wine to writing, drawing to gardening, neuroscience to shoe shining – Melburnians have a noticeable thirst for knowledge and a great love of community. Wheeler Centre, Laneway Learning and Smartbar at the Melbourne Museum are a few examples. Dan Hunter of Royal Mail Hotel fame, has opened his highly anticipated first solo project. Brae. Described as a place to “interact with nature and eat from the land,” Brae is set to put the small town of Birregurra on the map. Close to the Otways region of the Great Ocean Road, the only thing that seems guaranteed about the food is that there are no guarantees. Other new destination restaurants on the must-do list include Jack Rabbit Winery and neighbouring Terindah Shed in the Bellarine Peninsula, Broadgauge in the Murray River region, Gladioli in Inverleigh and Tani Eat & Drink in the High Country town of Bright. Regional food events in country Victoria are on the rise as the locavore trend gathers momentum. Grape Grazing Festival returns to the gourmet Yarra Valley region in 2014 from 14 – 16 February and in the Mornington Peninsula, visitors have some new help organising their gourmet itineraries in the form of the new Wine Food Farmgate website and trail kit with map highlighting the many delicious experiences available. Cricket fans rejoice, the iconic Melbourne Cricket Ground (MCG) will host yet another monumental sporting occasion as the English cricket team take on Australia at the Boxing Day Test (26-30 December) as part of the 2013-14 Ashes test series – then looking forward to March 2015, the MCG will also host five games including the final of the International Cricket World Cup. Keep up to date with all of Melbourne and Victoria’s latest destination news, events, launches, shopping, eating and drinking and more by subscribing to Pieces of Victoria for Australia, or Pieces of Victoria International. For more information, visit www.visitmelbourne.com.